Pain de Campagne baguettes made using traditional methods. Half-baked: you finish baking at home for the freshest French bread. - Ingredients: Wheat flour (65)*, water, leavening agent* (wheat flour*, water), unrefined sea salt. - This product contains gluten. Oven cook at 220°C for 10-12 minutes. 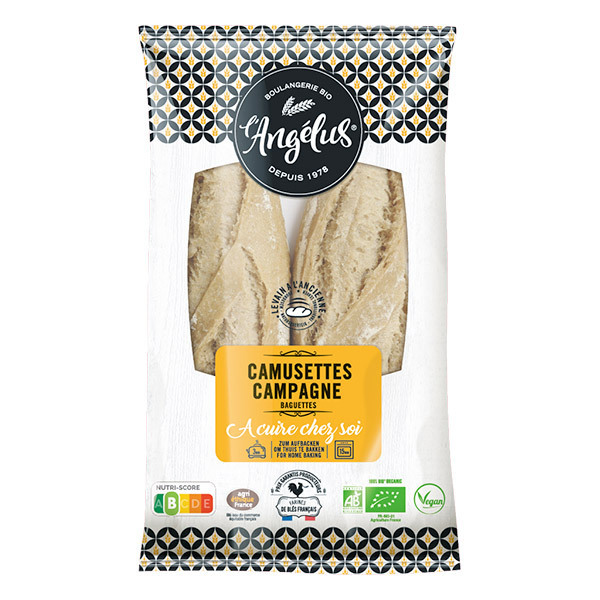 L’Angélus makes organic bread using an alternative leavening agent to yeast. In their traditional French bakery, the bread is made with wheat flour, water and salt, and a natural fermentation method that allows dough to rise without the addition or presence of yeast. The flour that goes into the bread is organically or bio-dynamically farmed. L’Angélus also uses organic seeds, olives, and nuts in the production of its products. Food safety at L'Angélus is controlled by HACCP in order to identify and prevent any microbiological, chemical or foreign body risk. Collaborating with their suppliers, L'Angélus also has implemented a system of traceability for its raw materials, carrying out 50% more tests than recommended and each bread produced being identified by a lot number, in order to trace back the flour used and the origin of the wheat for ensuring organic quality. Moreover, L'Angélus breads are made with 100% organic ingredients and are certified by Ecocert.